Well, we did a quick test using our HighOnAndroid SOT Battery Test and the results are in. The Galaxy Note 4 came in at 6 hours 7 minutes (we took 10 minutes out as the phone stopped during the middle of the test for about 10 minutes), Nexus 6 at 5 hours 53 minutes, and followed by the OnePlus One at 5 hours and 47 minutes. Also, this test confirms consistency of our HighOnAndroid SOT test results as our previous test showed Note 4 with 6 hours and 10 minutes screen time. For your reference, both the Note 4 and Nexus 6 feature Snapdragon 805 processor with 1440P screen while the OnePlus One has the older Snapdragon 801 processor with 1080P screen. The battery is same on the Note 4 and Nexus 6 with 3220mAh battery, and the OnePlus One with 2800mAh battery. From battery sizes, the SOT test seems to confirm it. But we did find out that just because there were more pixels doesn’t necessarily mean worse battery life (as we have also seen in our previous test with Note 3 vs. Note 4). Overall, the differences between these phablets are very small and although Note 4 clearly won it outright, it’s shouldn’t really affect your buying decision. And if you are worried that a 1440P resolution will hamper your battery life, you may be assured that 1440P screens have actually had better battery life than 1080P screens in all of our tests so far. 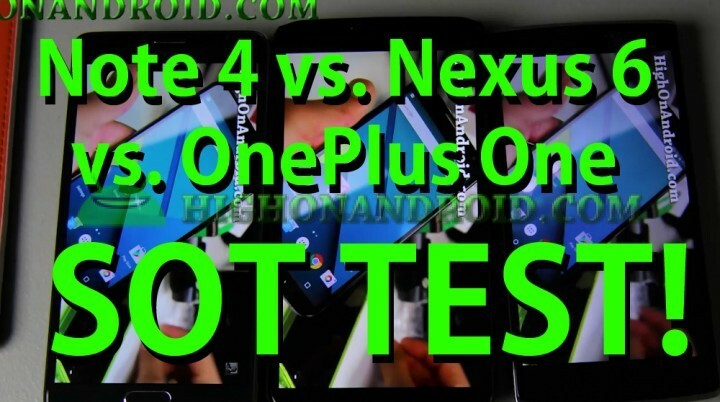 Next story LG G3 vs. G Flex 2 vs. Galaxy Note Edge SOT(Screen-On-Time) Battery Test! Previous story Galaxy S6 vs. S5 vs. Note 4 vs. Note 3 SOT(Screen-On-Time) Battery Test!